The Petzl Bindi is a super-compact, ultralight headlamp excellent for the front country, urban escapes, and EDC use. 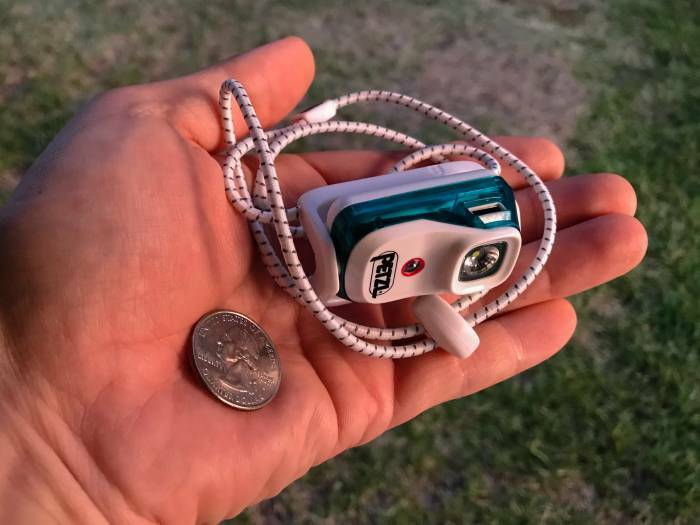 Petzl released the Bindi back in January, but the $60 rechargeable model wasn’t available until last month. We’ve used the diminutive Bindi for the past month to determine how capable a 1 15/16 x 1 x 1 13/16-inch headlamp that weighs a verified 1.3 ounces can be. In short: The Petzl Bindi is an ultralight companion for urban adventures, use in moderate terrain, and as a just-in-case EDC headlamp. The Bindi is a study of how small and light you can make a headlamp that’s still usable. The small size and low weight are impressive. But the other specifications display the limitations of a tiny package. There are three white lighting modes. The “proximity” mode puts out just 5 lumens of light but claims to do it for up to 50 hours. The “movement” mode claims 100 lumens for three hours. And the “distance” mode shines the light’s maximum output of 200 lumens for a claimed two hours. 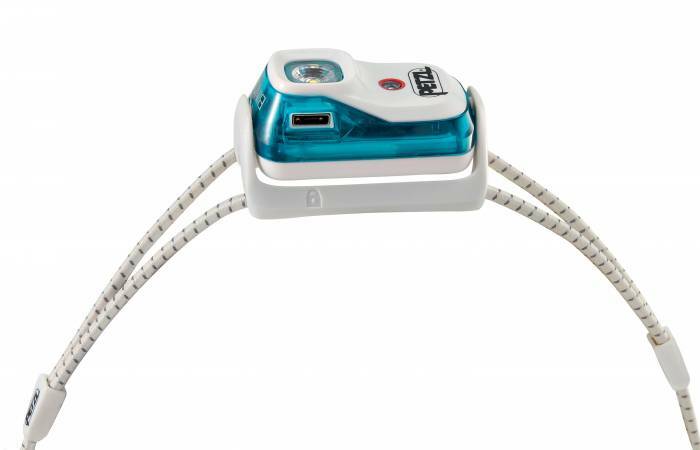 All these modes will work until the Bindi’s internal circuitry triggers the “reserve” mode, which preserves 3 lumens of light for an extra 1 hour 30 minutes, according to Petzl. There’s also a 3-lumen red “proximity” mode to preserve night vision that’s rated for 33 hours. Finally, the Bindi carries an emergency red strobe Petzl claims is visible for 400 meters and will run for 200 hours. 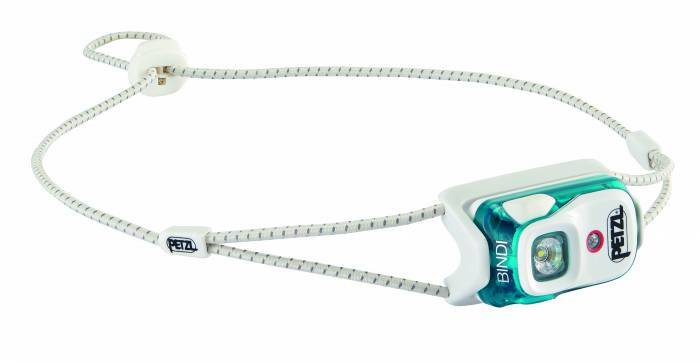 The Bindi uses elastic cords and a cord lock instead of a traditional elastic headband. The light swivels vertically in the housing for beam adjustment, and a micro-USB connection recharges the built-in 680-mAh battery. The CE-certified headlamp also has an IPX4 rating for water resistance. This refers to resistance against water spray, so if water breaches the housing, the light will still work due to stainless steel contacts and a waterproof coating on sensitive electronics. 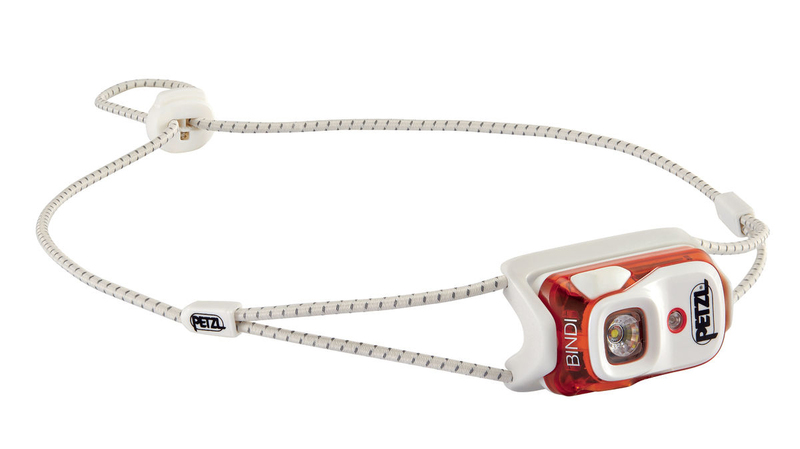 And the Petzl Bindi carries a three-year warranty against material or manufacturing defects. I presumed the Bindi’s elastic cords wouldn’t be as comfortable as standard headlamp straps. But the lamp’s light weight and the cord lock’s adjustability quickly produced a comfortable fit. The low mass also allowed the headlamp to remain stationary with very little elastic cord tension. Climbing helmet compatibility wasn’t an issue. The Bindi fit every helmet I own. The bungee cord system also allowed me to hang the Bindi around my neck or attach it to things like trekking pole handles. Plus, the Bindi’s diminutive size and svelte weight proved great for kids. Operating the light through the single button was intuitive: A single press turned on the white light, and subsequent presses scrolled through its three modes. An extended button hold activated the red light; pressing it again fired the red emergency beacon. The Bindi doesn’t have a memory for light mode, but it does switch on to the last-used color mode. The red LED also functions as a battery-life indicator, with three different colors that illuminate after the unit is switched off to represent remaining battery life in thirds. Plus, the red LED flashes every 30 seconds when the Bindi enters the reserve mode, giving a good warning that the light is running low. The Bindi has an electronic lock to prevent accidental powering while being stored, and the light swivels in its housing to shield the power button. The proximity mode was just bright enough to use while reading at night; other than that, it was straining to the eyes. The movement mode was bright enough to move about outdoors at casual speeds, cook at night, and perform other nonathletic activities in nontechnical environments. Meanwhile, the distance mode provided enough lumens to confidently move across flat ground at speed, like urban or front-country trails. The Bindi beam’s flood pattern made practical use of the light’s brightness with a spread that wasn’t too center-oriented. For this tester, however, moving confidently in any tricky terrain demands more power than the Bindi offered. Headlamps like Petzl’s Reactik+, which claims 300 lumens at maximum output, and Black Diamond’s Storm, with 350 claimed lumens at full power, are better choices when the path becomes more rugged. These, of course, are more substantial units. The Bindi is also restricted to shorter outings due to limited burn times, particularly in the middle setting of 100 lumens, which would see a lot of use in camping situations. Our test Petzl Reactik+ lasted 3 hours 15 minutes in this mode, compared to the 10 hours at 80 lumens and 5 hours at 170 lumens claimed with the product. Use for more extended outings may demand a recharging strategy. The Petzl Bindi is an ultra-compact, super-lightweight headlamp suited for urban, front-country, and tamer backcountry use. The trade-off for such a small headlamp is power and battery capacity. These limitations would keep the Bindi from my pack for any severe backcountry endeavor or movement over tricky terrain. But for in-town running, car camping, easy trail hiking, or overnight use in nontechnical areas, the Bindi provides a solution that’s hardly noticeable on the head or pack. 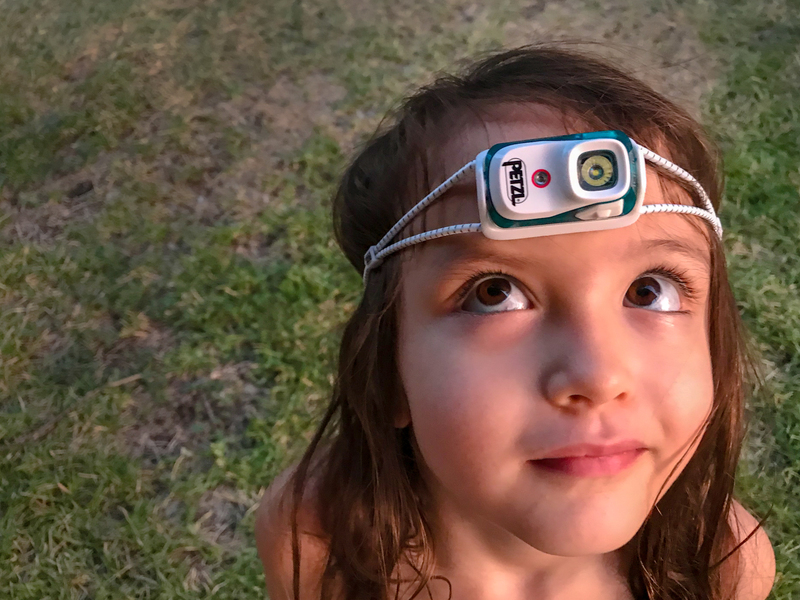 It’s perfect for EDC use, and the tiny size and minimal weight make the Bindi an excellent headlamp for kids! You can find the Petzl Bindi at REI for $60.